Recently, I’ve been thinking a lot about gateways and entries. Our wonderful new pedestrian entrance is the physical manifestation of these thoughts, but I’ve also been pondering entry points for a larger audience to experience the JC Raulston Arboretum. To that end, we’ve expanded our offerings to satisfy and engage new visitors. 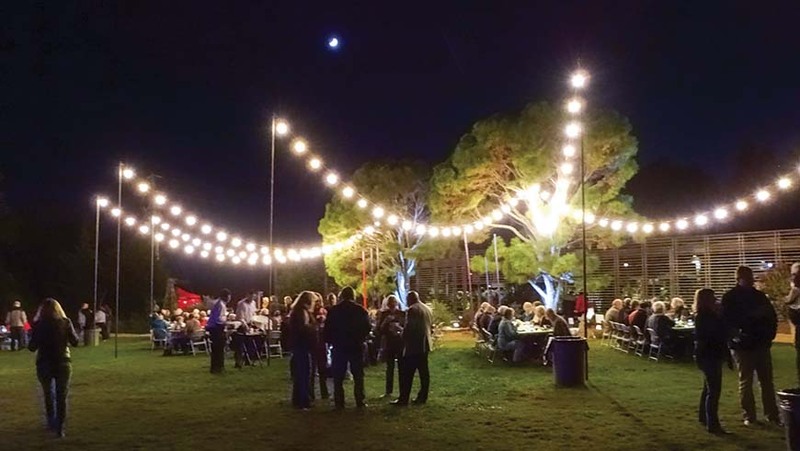 Moonlight in the Garden was a smashing success with over 2,600 attendees over two weekends. The majority of visitors were new to the garden and this event provided an entry point for folks who might never otherwise have visited a public garden. Many of these fresh faces told us that they are planning to come back to experience the garden during the day and were thrilled to learn about the Arboretum and its educational opportunities. New events and educational programs are great for providing entry points, but probably the best way to expose new audiences to the garden is through our existing members and supporters. Bringing a neighbor out to the JCRA for a program, recommending the Arboretum as a prime spot to visit, and sharing our social media posts are just some of the ways you help us convey our passion for plants. Speaking of support, NC State University recently launched an ambitious campaign to raise $1.6 billion by the year 2021. As a part of NC State University, gifts to the Arboretum Endowment for Excellence will help achieve the University’s goal while insuring the long-term viability of the JCRA. This support will also send a powerful message to the university that the JC Raulston Arboretum is a valued cultural institution, impactful regional resource, and respected national entity. Your backing, whether through volunteering, participating in programs, being an informal ambassador for the Arboretum, or providing financial support, is the critical piece that allows us to keep the gardens beautiful and the gates open. Thanks for all you do! NC Farm Bureau and Southern Farm Bureau Life Insurance Co. The cornerstone of the JC Raulston Arboretum’s collections policy is our landscape evaluations. Over the years, we’ve trialed tens of thousands of plants, many of which we knew had little hope of proving to be successful. On occasion, we are quite pleasantly surprised by the toughness of plants we don’t necessarily expect to thrive in our warm temperate climate. While we are often happy to see a new plant make it through its first winter, it generally takes three to five years to evaluate hardiness and sometimes quite a bit longer than that. We had a busy year in 2012 with over 1,350 plantings, about half of which were of taxa new to our collections. With several good winters behind us, including dips into single digit temperatures over that period, we are beginning to get a sense of plants which are likely to be good growers for central North Carolina. 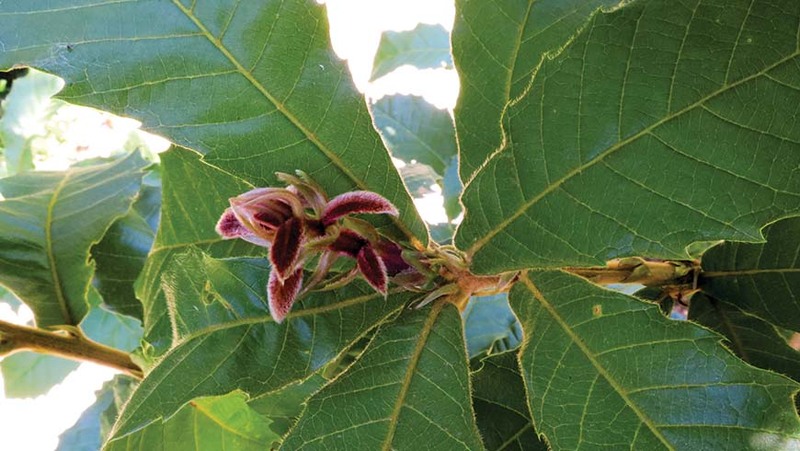 One standout from the 2012 planting is an unusual white oak species from Central America—Quercus insignis (page 3 header photograph). This oak’s claim to fame is the size of its acorns, which are golf ball size and with the associated cupule or cap, nearly tennis ball size, the largest of any oak. In its native habitat from southern Mexico (Veracruz) through all the Central American countries other than El Salvador, it can grow over 100’ tall but is more typically 40’–60’ tall. The new growth on the best forms emerges bright green covered in vivid red hairs. The veins on the bottom of mature leaves and young stems are clothed in rusty gold hairs. The foliage is semi-evergreen, corresponding to moisture rather than temperature in its native climes. It is a critically endangered species in the wild, and while we are not ready to promote it as completely hardy in zone 7, it is certainly hardier than the literature would indicate. Bear’s breeches are widely grown herbaceous perennials with distinctive foliage and tall spikes of white flowers with dusky purple calyces. Most species grown in gardens are relatively similar so when we got our hands on Acanthus sennii (page 4 header photograph), we were intrigued by how different it is from the plants we knew. This strange perennial is from the highlands of Ethiopia (not many others in the garden that we can boast come from that region) where it makes a rounded, shrubby plant to 5’ or more tall. 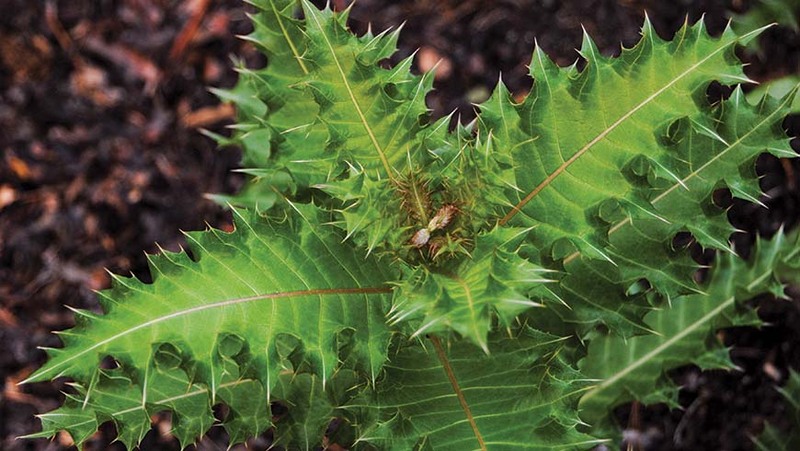 The foliage is viciously spiny with white veins growing along purple-black stems. New growth is covered in white hairs and tinted red along the edges. In temperate gardens, the tops die back to the ground in winter and rather than becoming shrubby during the growing season, it is more of a sprawling plant, sending stems creeping along the ground. It is a late fall/winter-flowering plant and the flowers’ buds have mostly been lost to a freeze before opening, but on years that stay warm late enough, we are rewarded with square spikes of large, orange-red flowers. 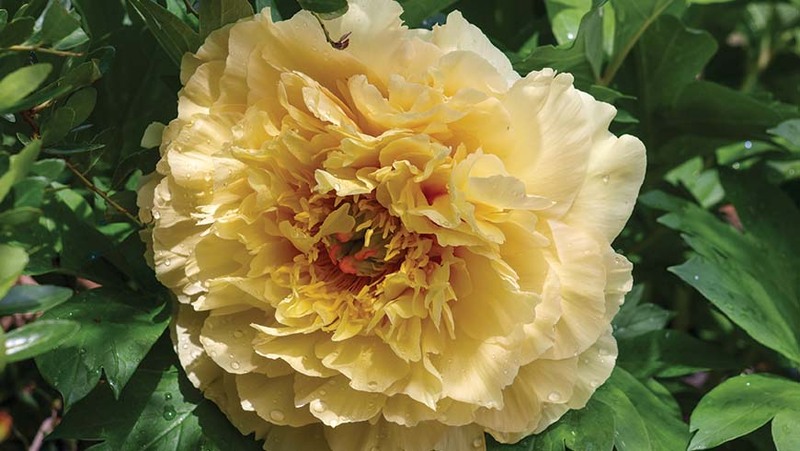 Grow it in a bright spot in exceptionally well-drained soil and in a spot where the sprawling stems covered in vicious leaves can’t attack unwary passersby. In foliage and in flower, it is an incredibly striking specimen. 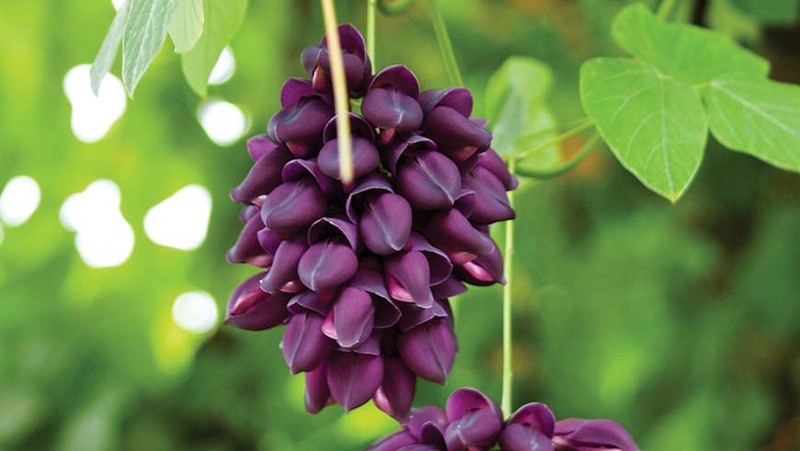 Another surprise is the exceptionally vigorous vine, Mucuna cyclocarpa, also known as purple jade vine or in China as min you ma teng. We assumed this bean family member would make for an interesting annual to cover a bare spot in the Lath House. We were surprised when it returned and after the fourth year, we expect it to continue sprouting reliably. As with so many other plants, I first encountered it at Juniper Level Botanic Gardens at Plant Delights Nursery where it was decorating a fence surrounding a staff vegetable garden. It is a vigorous growing woody vine from relatively low elevations in southeast China. The foliage makes it easy for gardeners to place it in the bean (Fabaceae) family as the three-part leaves look much like common garden beans, but are typically larger and the terminal leaflet has a cordate or heart-shaped base. While the foliage of M. cyclocarpa makes a lovely backdrop, the flowers of purple jade vine are what really excite. Huge clusters the size of a grapefruit dangle from the stems. The Flora of China says it flowers on old wood, but our experience says otherwise. The flower clusters are composed of dozens of deep, dusky purple blossoms with a texture like thick plastic. The flowers can be somewhat obscured by the foliage, but when grown on a horizontal structure such as the top of an arbor, the clusters will dangle like grape bunches. While this is a large woody vine in the subtropics, it dies to the ground for us each winter and comes back with a vengeance in spring. 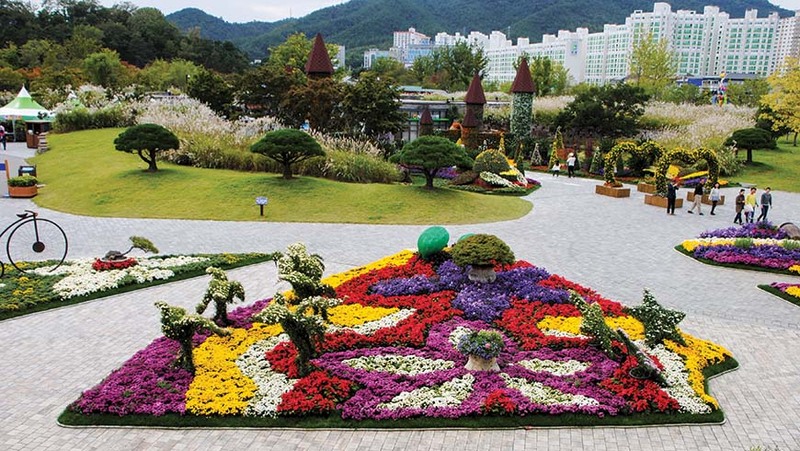 I’ve had the opportunity over the past decade to spend quite a bit of time in Asia but I had never been to the Republic of Korea so when I was invited to be a presenter at the 2016 Suncheon International Garden Industry Symposium, I jumped at the opportunity. Suncheon is a city on the southern tip of the Korean Peninsula with a large, relatively new botanic garden and a desire to be known as “the garden city of Korea.” To this end, the city Suncheon invited industry experts to come and give their perspective on creating and growing a green industry. Joining me in presenting talks at this lecture was Fujio Hirata, a professor at the University of Hyogo in Japan; Sheng Xiangxue, the president of the Wuhan Landscape Architectural Design Institute in China; and Raoul Curtis-Martin, the head of horticulture from the United Kingdom’s Horticultural Trades Association. Circumstances didn’t allow me to explore the country and flora of South Korea for as long as I would have liked, but since I was already in the area, I teamed up with Scott McMahan from the Atlanta Botanical Garden for a little seed-collecting in eastern China and to forge some new relationships with the Shanghai Chenshan Botanical Garden. We returned to the site of my first visit to China—Tianmushan or Mt. Tianmu. The flora of these low mountains is quite rich and diverse, but for some reason has been overlooked in favor of more western sites in Sichuan and Yunnan. A primary goal for me was to find the gorgeous, huge-leafed, mottle-barked Litsea auriculata. This plant has danced in my dreams since I first saw it in 2008. It grows with Emmenopterys, Ginkgo, and Pseudolarix, so I anticipate it being perfectly suited to central North Carolina. Catching sight of this tree again made the cold wind, leeches, and a mutant spider insect (I’m told it was a whip scorpion, actually) that shared my bedroom all worthwhile. Other plants like Hydrangea rosthornii, Arisaema engleri, and Daphne grueningiana made up only a small fraction of the amazing flora of the region. I was especially interested to see a population of Hemiboea subcapitata—an African violet and gloxinia relative—growing to 30” tall, more than twice the height of the other forms we’ve grown. I finished my trip with a visit to the amazing Chenshan Botanic Garden which is built around the site of an old quarry. It is certainly unique among public gardens. In the six years since I last visited, which was shortly before they opened, this garden has become a powerhouse in horticultural research and display. We met with the director, an old acquaintance from his Shanghai Botanical Garden days, and several researchers who seem keen to develop working relationships and exchanges. It was a short trip, but certainly a productive one. I hope to visit my new friends in both South Korea and China again in the very near future. The 2016 Arboretum trek to South Africa was a smashing success! 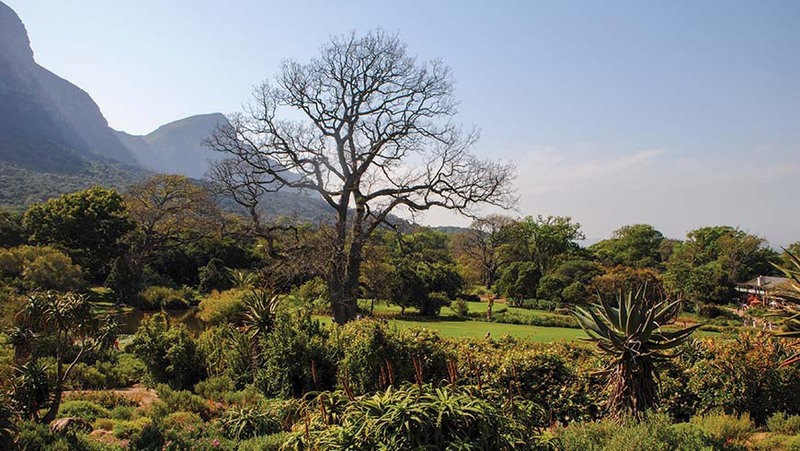 Stunning gardens, delicious food and wine, wild animals, and great guides made for a once-in-a-lifetime experience. Moving and educational visits to the prison where Nelson Mandela spent decades of his life and to his home in Soweto made for a cultural milestone, while the safari drives brought us almost within touching distance of elephants, giraffes, rhinos, and within yards of lions. 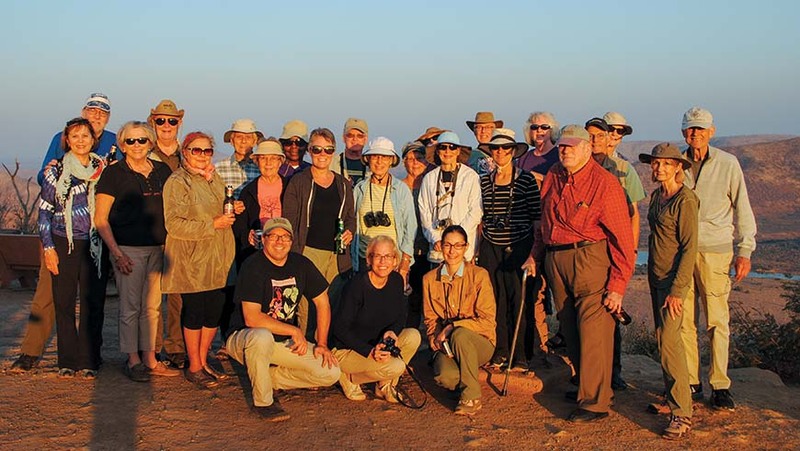 The one common thread through all of our trips—whether to South Africa, Cuba, Vancouver, or England—is the wonderful friendships developed and experiences shared with other Arboretum members. Even the self-described “non-gardeners” in the group have all had great experiences. Our next garden adventure will be to experience the gardens, wine, art, food, and markets of one of the most beautiful areas of the world—the Italian Lake District, Monaco, the Riviera, and Provence. Our trip will begin on the shores of Lake Como where we will stroll through stunning gardens and charming lakeside towns with breathtaking views. Our garden adventure will continue as we head south toward Menton on the French Riviera. We’ll explore some of the planet’s most beautiful gardens and visit the botanical gardens of Monaco. From Monaco, we will make our way to Arles, one of Vincent Van Gogh’s homes in Provence, and a charming town full of great restaurants and Roman archaeological treasures. It was here that Van Gogh painted his famous café scenes and lived with Paul Gauguin in the Studio of the South. The hill towns beckon, so we’ve planned excursions into the countryside to soak up the sunny ambiance and one of the famed Provençal open-air markets. We’ll end our journey in Nice on the Côte d’Azur. Whatever your passion—gardens, food, wine, art, or history—this experience will provide a lifetime of memories. For more information, go to https://jcra.ncsu.edu/travel/ or e-mail Mark Weathington at mark_weathington@ncsu.edu. 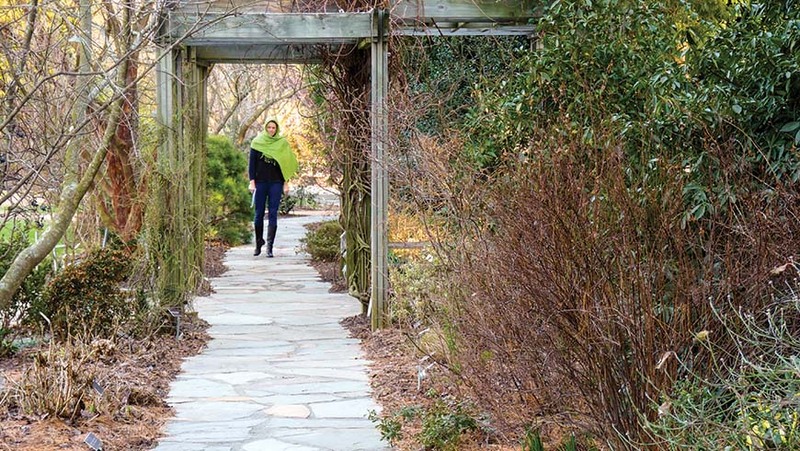 If you stroll through the JC Raulston Arboretum on any given weekend, you will inevitably run into a few well-dressed folks dashing to a specific garden in a hurry. Directional signage and reserved notices are a common occurrence on most spring and fall weekends because the JC Raulston Arboretum is quickly becoming a hotspot for events of all kinds. With gardens as manicured and artfully cultivated as ours, it is no surprise that wedding parties flock to this ten-acre, lush space for ceremonies and receptions. The JC Raulston Arboretum had the honor of hosting 60 weddings in 2016, with an average of two to three per weekend, mainly in spring and fall. Groups appreciate the ten different outdoor spaces, along with our versatile indoor space—the York Auditorium. Since we have no vendor restrictions, many wedding parties also decide to use the York Auditorium for their wedding showers, rehearsal dinners, cocktail hours, and the entire reception. 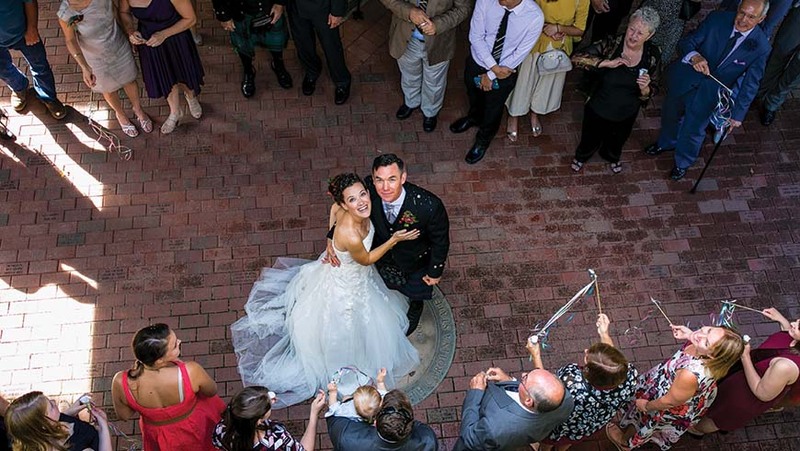 In addition to the numerous weddings at the JC Raulston Arboretum, there are a variety of other functions whose organizers have enjoyed using a garden or indoor room to entertain guests. The York Auditorium can function as one large room or be divided into three smaller spaces, comfortably fitting groups from 20 to 150 people. 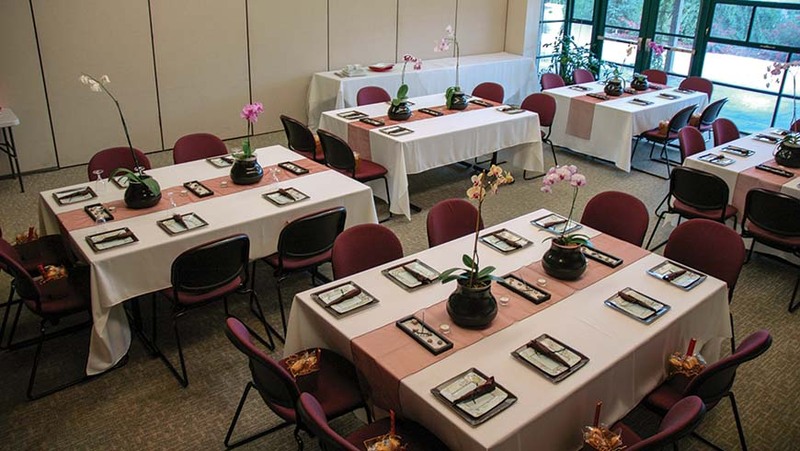 This leads to the potential for a wide variety of events, such as retirement celebrations, baby showers, corporate meetings, team retreats, and birthday parties. 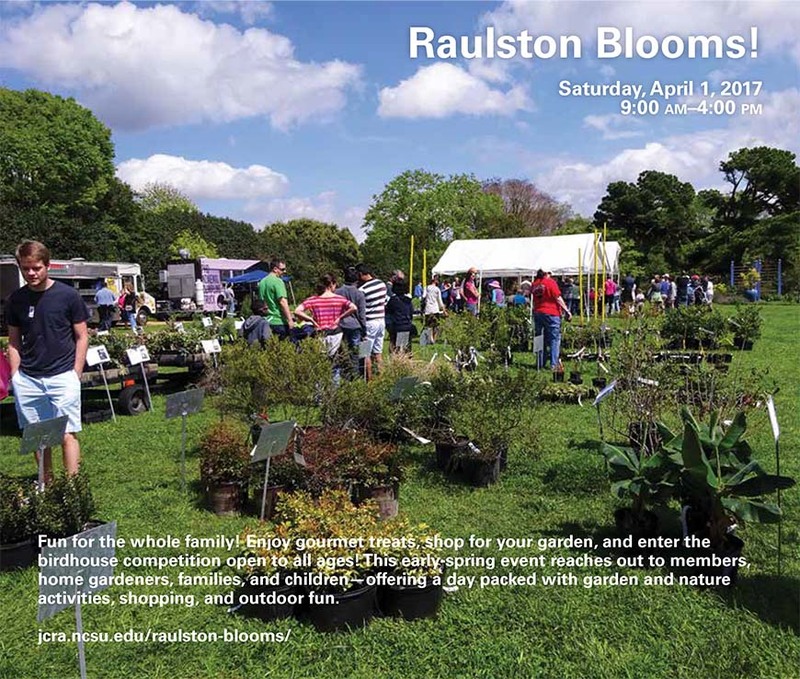 Furthermore, it is an honor that the JC Raulston Arboretum is often used in “Celebration of Life” memorials to remember the lives of outdoor enthusiasts and environmental advocates. 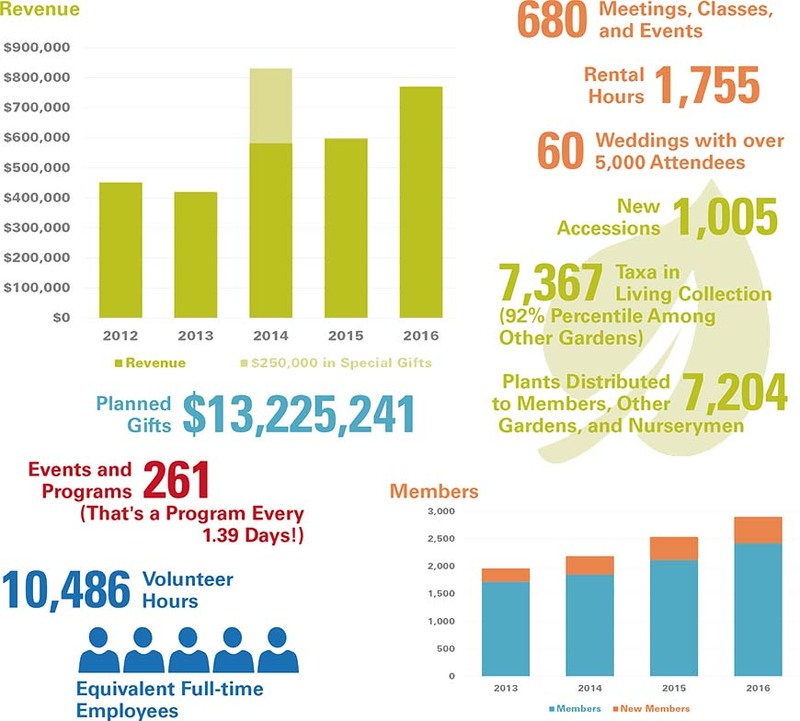 Rental revenue supports many different aspects of the garden’s mission. On the surface, the financial component of these events directly supports keeping the garden free and open to the public every day. 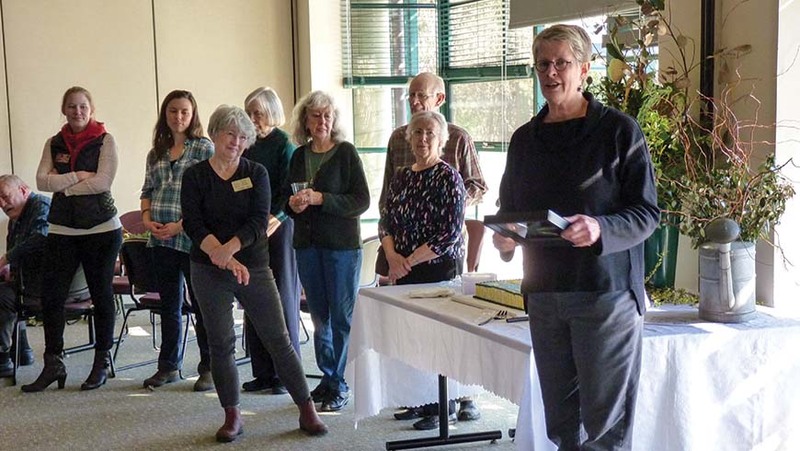 But the lasting value of these special occasions occurring at the JC Raulston Arboretum supports the mission of engaging the public and creating long-term stakeholders. To enjoy our spaces, indoor or outside, for an event you are planning, contact Emily Peters at emily_peters@nsu.edu or (919) 513-7457 or visit https://jcra.ncsu.edu/rentals/. The beautiful new entrance that now announces the Arboretum illustrates how far J. C.’s belief in “tomorrow” has inspired us to go. 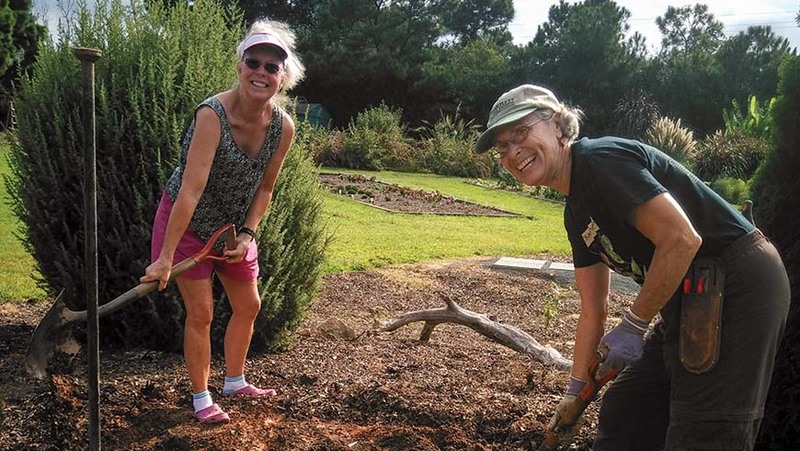 At the wise age of 40, our arboretum—and our generous community of gardeners—is consistently taking on new projects and embarking on new adventures such as Moonlight in the Garden, a newly renovated rose garden, and a future ornamental edibles garden. Already, new people driving by on Beryl Road are coming in, asking what the place is and what people live behind this new gate! 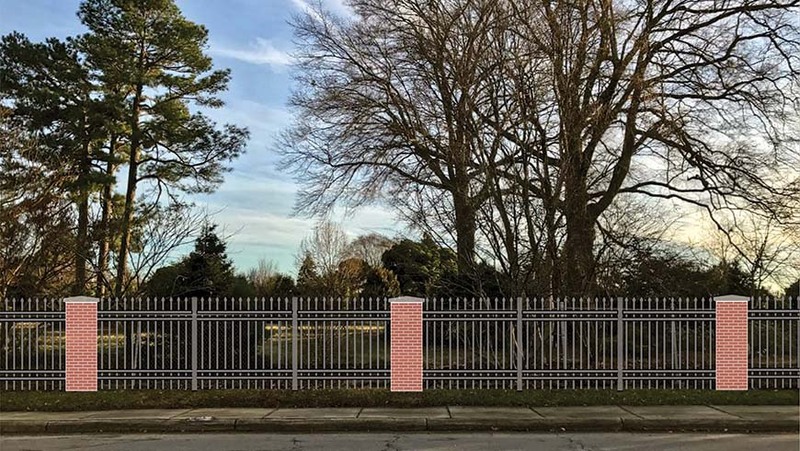 Join in and help us complete the new “window” into the Arboretum by naming a portion of the extension of the new entrance extension on Beryl Road. We are extending the red brick columns of the entrance all the way down Beryl Road. Naming opportunities are $25,000–$50,000. Contact Sonia Murphy for information or questions at (919) 513-0637 or sonia_murphy@ncsu.edu. The JCRA's Moonlight in the Garden event opened our eyes to the growth potential of having events after dark. We invite you to join our initiative to bring permanent landscape lighting and improvements to one of the South's great gardens. Landscape lighting is an investment in the Arboretum's future—and the future of gardening. We've created a list of improvements (https://jcra.ncsu.edu/wish-list/) that will help attract more rental opportunities to our gardens and to the Ruby C. McSwain Education Center. Please consider helping us make them a reality. For more information, please contact Sonia Murphy at (919) 515-0637 or sonia_murphy@ncsu.edu. Our 40th year was a great one for the Arboretum. 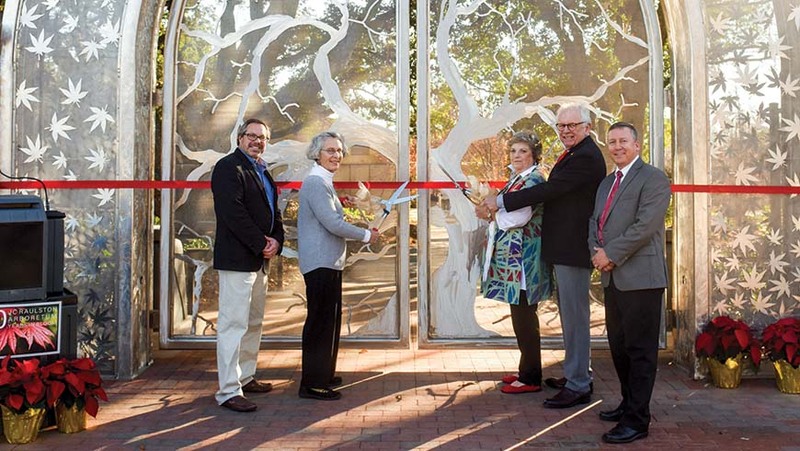 We set records in membership, installed a new pedestrian entrance, and celebrated our anniversary with several events including a 40th Anniversary Symposium and Moonlight in the Garden. We did a lot of traveling, including a speaking engagement in South Korea, plant collecting in China, and leading a tour to South Africa. And, more than $47,000 was given towards our end-of-year appeal for garden improvements, landscaping lighting, and other renovations. There are many people to thank for their continued support. In an effort to conserve resources, the full 2016 annual report is being offered on the JCRA Web site at https://jcra.ncsu.edu/publications/annual-reports/ instead of printed copies. We saw growth in our strong volunteer program in 2016, involving 290 total volunteers. Our top categories were gardening, Visitor Center, children's programs, and special events. Moonlight in the Garden brought 77 new volunteers: students from five area high schools, including a large group from the Green Hope High School Key Club, joined in. Students from NC State University and Meredith College as well as others who found out about us through the volunteer clearinghouse Activate Good or through our own Web site also helped. Many of these people had never been to the Arboretum before! Volunteers led another project focused on renewing and refreshing the Arboretum’s outstanding conifer collection in advance of the national Conifer Society meeting here in June 2018. Volunteers also wish to strengthen the tradition of conifers as a mainstay of the JCRA collections. Current efforts are being concentrated in the new planting beds installed in 2013 near the Monocot Garden and the new rain garden. If you haven’t visited this area recently, do take a look at the changes that have been made! We installed many unusual conifers from leading grower Iseli Nurseries, funded by a grant from the American Conifer Society. Sizable salvaged boulders, located by conifer stalwart Beth Jimenez, were installed by a small but mighty crew, led by the intrepid Tim Alderton and his Ditch Witch. In October, more plants, many donated by western North Carolina conifer guru Bruce Appeldoorn, were installed. Some members of the group visited the authority on conifers for the Southeast, Tom Cox, at his arboretum in Canton, Georgia. He provided cuttings of some of his rare and unusual conifers for propagating this January by our own Lizzi Lathers.